What Continent Is Syria In? Syria is a Middle Eastern country located in the western region of the continent of Asia. Syria is part of the Middle East. The Syrian Arab Republic is a Middle Eastern country located in the western part of the continent of Asia. Damascus is the capital of the country and the second largest city, while Aleppo is the largest city. Israel has occupied Syria's western two-thirds of Golan Heights since 1967, and in 1981 Israel managed to take over the region. Syria governs the remaining third of the eastern side of the country. The United Nations Disengagement Observer Force maintains a barrier between the two sides. The country has an area of 71,500 square miles, and the population was estimated at 17,064,854 in 2014. Syria became a republic on October 24, 1945, and it was one of the founding members of the United Nations. The country is a member of only one other international organization which is the Non-Aligned Movement. Syria has been ravaged by war since independence with several coups and attempted coups happening. 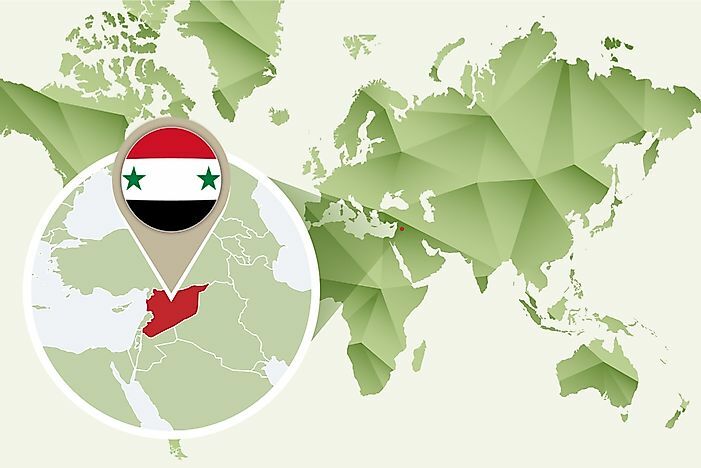 In 1958, Syria came together with Egypt to form the United Arab Republic, but this was short-lived, and the republic was disbanded by a Syrian coup in 1961. In 1963, the Ba'ath party took power through the Ba'athist coup, and the party has been in power since then. As of March 2011, the country has been in conflict with some countries within the region. Syria comes last on the Global Peace Index. The present Syrian civil war began in 2011 as a series of peaceful demonstrations which were suppressed by the army. In July of the same year, the Free Syrian Army was formed by individuals who had defected from the national army. The Alawites constitute the ruling government while the Sunni Muslims are in the opposition. The unrest has led some people to seek refuge in neighboring countries with several others displaced. The Syrian economy relies on income and customs tax, agriculture, and oil. 40% of the export income comes from the oil industry, and agriculture contributes to 20% of the GDP. At present, the economy relies on loans from Russia, Iran, and China. The on-going civil unrest in the country has led to a decline in the country's economy with the tourism and investment sectors doing poorly. The Middle East is an intercontinental region that encompasses 16 countries in Western Asia, as well as Egypt and Turkey to make a total of 18 countries. Cairo, Tehran, and Istanbul are the largest cities in the region. According to the World Bank, the largest economies in the Middle East in 2008, regarding nominal GDP, were that of Iran, Saudi Arabia, and Turkey. Asia is the largest continent in the world both regarding size and population. The continent is at times named Eurasia, and it is located in the North-Eastern hemisphere. The continent has an area of 17,212,000 square miles, which is 30% of Earth's landmass. Asia's population is estimated at 4.436 billion in 2016, and this is 60% of the global population. The continent has 48 UN member states and six other states. Three of the countries, Russia, Turkey and Kazakhstan, have a portion of their land mass in Europe. Asia's nominal GDP ranks second globally, but it ranks first when calculated based on PPP. What Do The Colors And Symbols Of The Flag Of Syria Mean?